Image: Racial incidents between servicemen and African Americans in San Diego. Credit: The National Archives at Riverside. To recap briefly, I have been digging into the historical basis of the movie “Zoot Suit,” which I saw this summer in the Last Remaining Seats series. The Times ignored the 1943 Zoot Suit Riots for several days, in what must be one of the worst news decisions the editors ever made, so I was forced to dig into the government records at the National Archives in Riverside for further information. 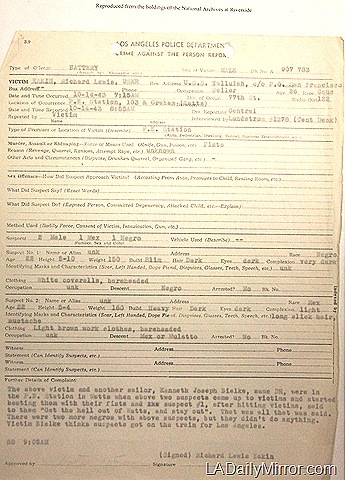 Another thread of the Zoot Suit Riots – racial tensions – also emerges in the Navy records immediately before and after the riots. 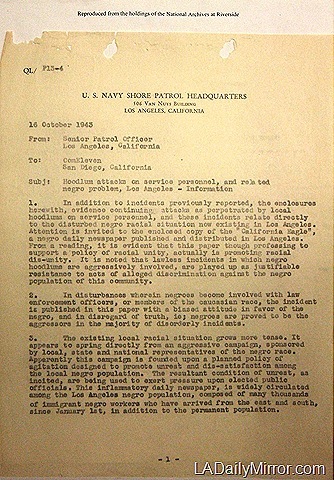 This Nov. 13, 1942, document reports attacks by blacks on servicemen in San Diego. Additional reliable information is to the effect that the enlisted personnel of the U.S. Navy have a growing unrest due to the above situation, and are contemplating some concerted action in reprisal to these attacks. The local police authorities have been officially notified of the subject attacks. This entry was posted in 1942, 1943, African Americans, Film, Hollywood, LAPD, Latinos, Libraries, World War II, Zoot Suit and tagged #film, #hollywood, #la, #LAPD, #zoot suits. Bookmark the permalink.